Rick Ambrose, head of space business at Lockheed Martin, has said the company’s partnership with Amazon Web Services aims to make access to satellite-based data less expensive for firms and other stakeholders, the Washington Post reported Friday. “If you look at the challenges people have with putting up satellites, it’s very cost-prohibitive to put ground networks in,” Ambrose said. 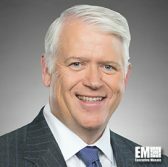 Lockheed agreed to integrate its Verge antenna network with the AWS Ground Station to help users accelerate satellite data processing and analysis under a multiyear agreement. “It’s only today with the power of cloud computing can we pull off the processing speeds to do this,” Ambrose added.